Learning the trade on a stock 1996 S1 Lotus Elise, how long until the tickering starts? This was the start of it all and probably the reason why you are browsing this website. After many years of tinkering with larger Turbo powered cars, the Series 1 Lotus Elise was always a car that was on my ‘must own’ list. A friend bought a brand new Elise in Norfolk Mustard Yellow in 1998. The looks, handling and stripped out interior really ticked all the boxes. The only thing it lacked was the straight line power of some of my previous cars, but as I enjoyed working on cars I knew that it couldn’t be too hard to sort, right? 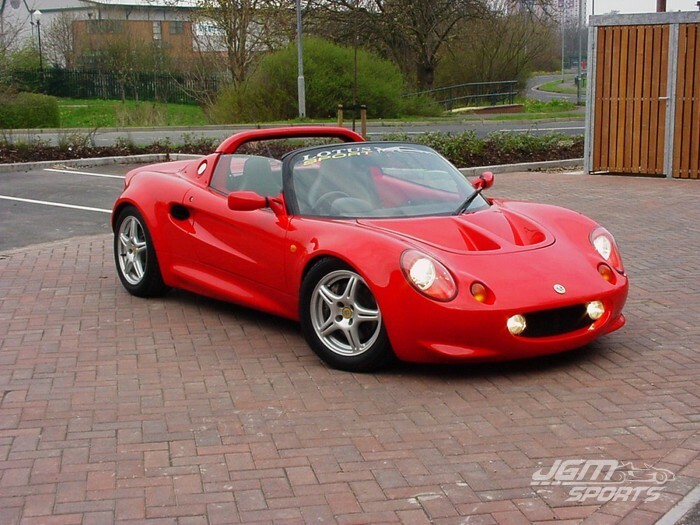 In 2004 I went to look at a very early 1996 Elise in Calypso Red and purchased it straight away. It had 19,000 miles on the clock and was a very nice standard car. To say I went into Lotus ownership ‘blind’ was an understatement. Apart from passenger rides in the yellow Elise I knew nothing about them. So once I had collected my red Lotus it was time to start the learning curve. The next month or so I found out a few basic features, one being that the front bonnet opens! It took me two weeks to find the bonnet release cable under the dash and that it had a temperature gauge! The blue temperature sender in the engine was faulty so the stack dash read blank. I was unaware of any of the niggles with these cars such as the head gasket failures. I had no worries….. ignorance is bliss! After a month of getting used to it, I was getting itchy feet to make some improvements. First off I fitted some race coilovers suspension, decat and a sports exhaust. The car sounded better and had a better stance but I started to miss the poke of my old turbo charged cars. 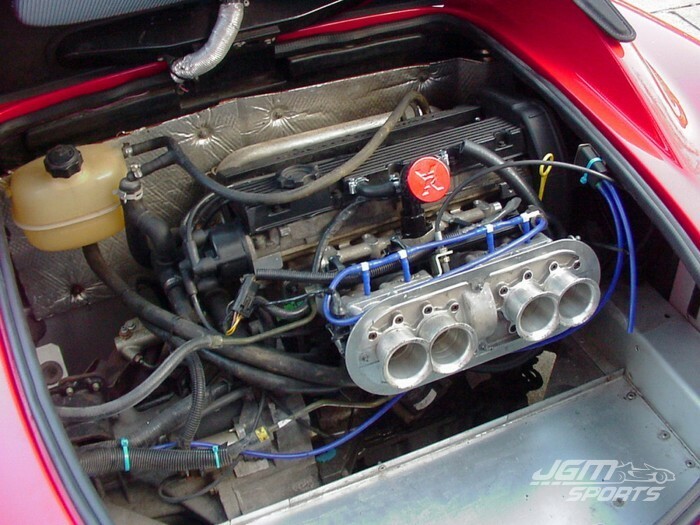 I did a little research on the popular power upgrades for the Elise and the usual induction kits, 52mm alloy throttle body upgrades all got thrown about. Not being one to follow the crowd, I decided to kill two birds with one stone and skip the single 52mm upgrade induction kit and buy a second hand set of throttle bodies – that should do the trick! Once fitted the sound was fantastic and performance was improved especially at 6,000rpm when the original engine ran out of puff, it just kept going until the rev limiter. I wouldn’t recommend doing this now without a programmable ECU as the fueling must have been all over the place. 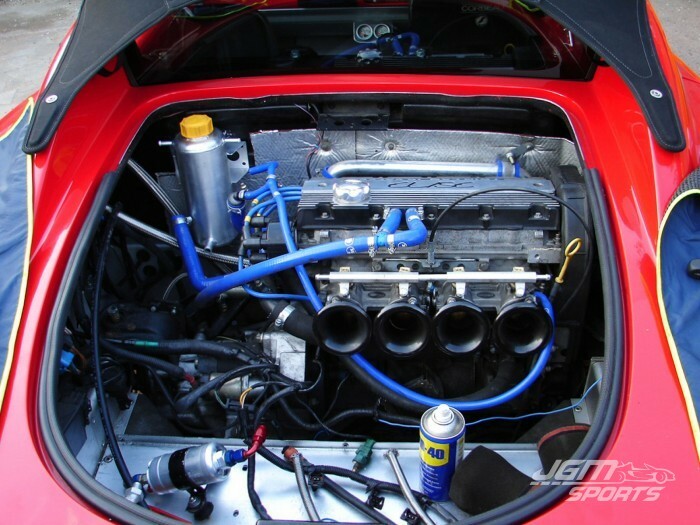 I drove the Elise around like this for a month or so but as always I wanted more power. After searching the classifieds a fully worked VHPD (Very High Performance Derivative) 196bhp race engine was found. This included throttle bodies, 4-2-1 manifold, programmable ECU mapped for the engine, lightweight flywheel and close ratio box, making a complete package. Again ignorance is bliss and having no idea of the ‘ticking time bomb’ reputation of the VHPD. The purchase was made and fitted in the space of a week; from 130bhp to 196bhp with a 8,100rpm rev limit coupled to a close ratio box the car was completely transformed, it now went as well as it sounded and looked! Each weekend had its own project of fitting upgrades such as air-to-oil cooler, remote thermostat, silicone hose set, alloy front radiator, tomcat lsd, full throttle gear shift system, interior gauges, racing seat, Sport 160 rear spoiler, Exige wheels, front splitter, brake upgrades, the list goes on. The car was an animal keeping up with ‘normal size’ cars with twice its power and fantastic fun. It was in daily use and really being enjoyed. When you consider six months previously I didn’t know how to open the bonnet, progress was going well. Further upgrades were now just weekend tinkering jobs. I had the map checked on the rolling road as I was using a different exhaust than the engine was originally mapped with. It came back right on the power with 196bhp but the operator did comment on a big torque dip in the mid-range that he could map out, so after a couple of extra days I collected the car with the mid-range vastly improved and the added bonus of an extra 2bhp, now totalling 198bhp! The car felt transformed again. The operator also mentioned the standard fuel pump was near its limit but OK at the moment due to it being a low mileage unit. So the next project was the fuel system. A fuel swirl pot, custom made header tank, 044 fuel pump and an adjustable fuel pressure regulator were all ordered and work started. As I was using aerquip connectors and braided lines I had to ditch the standard plastic fuel rail and upgrade to an alloy version. This meant that the back plate to the airbox would no longer fit. So socks for the trumpets were ordered, numerous aerquip fittings and metres of braided hose…. I love it when a project gets out of control! 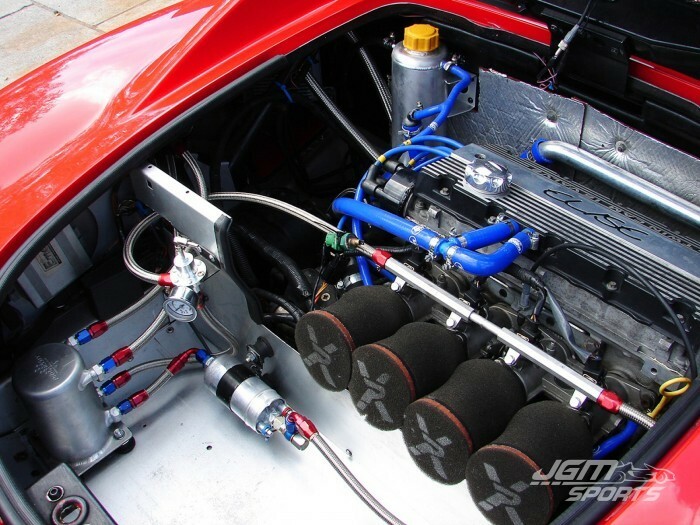 But the end result was worth it, I had a future proof fuel supply which was good for over 400bhp a little OTT but when the setup looks like this…. Over the next few years I really enjoyed the car, there was only one low point when the head gasket finally went! Welcome to the world of K-series/VHPD but this was soon fixed and I can honestly say the good times far outweighed the only failure. As well as a daily driver it was used for fun events such as sprinting, airfield days, car shows and runs out with the Lotus group. I had also found a great benchmark for drive train upgrades – 1/4mile drag strip racing, not very Lotus I know! When the car was stock I ran a 14.9 second quarter mile. Then with the 198bhp engine fitted I ran a 13.2 second. Over the years with all the small upgrades I got the time down to a personal best of 12.8 seconds. The bond between me and this Elise was like no other car I’d ever had. On the day I ran the 12.8 seconds quarter mile I made 12 runs, 3 runs at 12.8 seconds and the slowest at 13 seconds dead. That makes 12 runs all within 0.2 seconds of each other. These times were all set with road tyres. I went along with friends to a Ford RS owner’s club event where they were running a 0-60mph challenge. So I decided to gate-crash it with the Elise and ended up winning with a 0-60mph time of 4.8 seconds. With constant upgrades to all areas of the Elise it became quite a unique looking car by the end. After many years of enjoyment I thought it might be time to move on. I advertised the car at a fairly strong price and after a short time the car was bought by a car tuning company in Ireland who still own the car to this day. 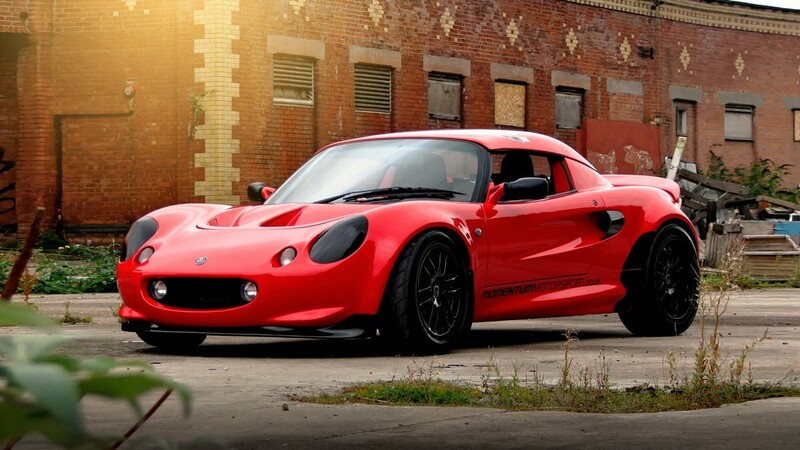 Although the exterior looks exactly the same, the car has gone on to be their project car and now sports a 350+bhp supercharged Honda conversion with custom rear subframe, race dash and is one of the highest spec’d Elise’s about. I was sorry to see the car go but glad it went to such a great home and it lead to me owning 100’s of further Lotus’s including some great projects.